With the Christmas Day arrival at the Red Planet fast approaching, the tiny British Beagle 2 lander was successfully cast free from the Mars Express space probe today. While Mars Express will enter orbit around the planet next week to study its atmosphere and geology, Beagle 2 is bound for surface to conduct a host of experiments including some to look for evidence of past life. The Beagle 2 lander, packaged inside a protective descent module, undocked from the Mars Express orbiter with the push of a spring. The physical separation between the two spacecraft, which have spent six months flying as one since launching from Earth June 2, occurred as planned at 0831 GMT (3:31 a.m. EST). Telemetry data was not available from Mars Express at the time of deploy or the subsequent two hours. When information did resume flowing, it took a half-hour for engineers to analyze the data before mission officials could confirm with absolute certainty that Beagle 2 was ejected safely. "It has been a very tense morning," Professor David Southwood, director of the European Space Agency's science program, said from the control room. "But this is just the beginning. We've got to wait now until Christmas Day to really make the next major steps. But for now we've made the first step really well. I am feeling very confident that the mother and baby are both doing well. Let's look forward to see how the family develops." INSYS Limited designed and developed the so-called Spin-Up and Ejection Mechanism, or SUEM, that held Beagle 2 to Mars Express and then deployed the lander this morning. "The SUEM acts as both a launch clamp and an ejection mechanism. During the launch phase, the SUEM clamped Beagle 2 to Mars Express by the use of three cup/cone interfaces, secured with special notched bolts," according to INSYS Limited. "A few days after launch the bolts were broken by being heated, which has left the SUEM holding Beagle 2 onto Mars Express solely by the use of its ball latching ejection system. Six days prior to landing on Mars, the ejection mechanism will release Beagle 2, allowing it to descend into the Martian atmosphere. 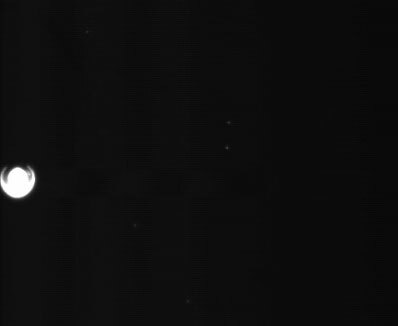 This is performed by firing an explosive pin, which releases the ball latching system, separates the electrical umbilical connector and finally, allows a guided spring to spin up and eject Beagle 2 from Mars Express." The mechanism placed Beagle 2 in a rotating motion, like a spinning top, in an effort to keep it stabilized during the cruise to Mars. Earlier this week, flight controllers at the European Space Operations Center in Darmstadt, Germany, put Mars Express through a precision-pointing maneuver to prepare for the lander release. Beagle 2 has no propulsion system to change its course, meaning the orbiter had to deliver the lander on the perfect trajectory for its journey to the planet. 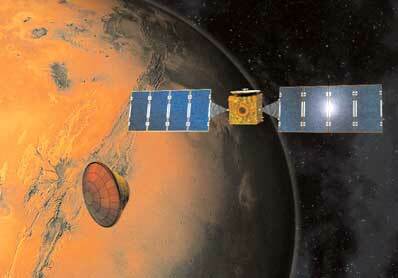 On Saturday, Mars Express was undergo another maneuver to re-point itself on a path for orbit insertion. At present, the craft is on a collision course with the planet. Beagle's landing site is Isidis Planitia, a basin located near the equator of Mars. As the lander encounters the first traces of the Martian atmosphere, the heat shield take the brunt of the thermal heating. Parachutes will then deploy to slow the craft further, before the lander is released to a soft landing cushioned by air bags. Landing is expected around 0254 GMT Christmas Day (9:54 p.m. EST Dec. 24). NASA's Mars Odyssey spacecraft will fly over Beagle at 0515 GMT (12:15 a.m. EST), providing the first possible signal relay from the lander. The air bags will then deflate, allowing Beagle 2 to unfurl its four solar array petals and robotic arm to begin the scientific investigations. With a landed mass of just 72 pounds, the minuscule craft has a daunting task ahead of it -- the task of searching for evidence of past life on Mars. In addition to the expected suite of cameras included in the payload, Beagle 2 also sports instruments designed to look for the presence of water, the existence of carbon molecules, and also to focus on potential organic materials, all of which are smoking guns for past life. Other science goals include investigating the surface geology, the contents of the Martian atmosphere, and measuring a number of meteorological criteria at the landing site. For more on the Beagle 2 mission's science objectives, see our separate story. At virtually the same time that Beagle is touching down, Mars Express will fire its engine to enter Martian orbit -- an elliptical orbit around the poles of the Red Planet.